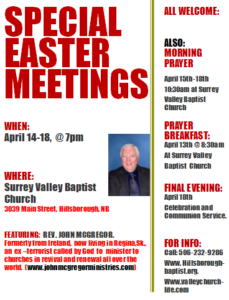 Easter Special Meetings | Albert Association of Convention Baptist Churches inc. 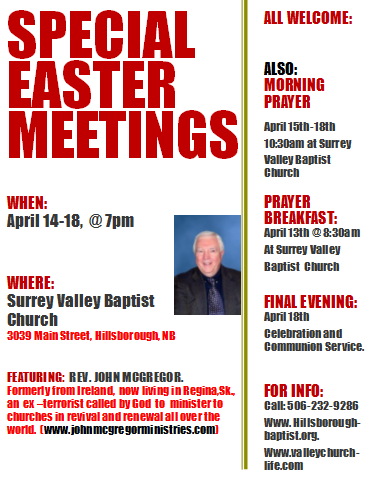 The Churches in the Eastern Albert County are planning special Easter Meetings at Surrey Valley April 14th-18th, at 7pm. The Speaker is Evangelist, the Rev. John McGregor, formerly of Ireland and now residing in Regina, Sk. These meetings will center on Revival and Renewal. Everyone welcome. There will also be a Prayer Breakfast on Saturday, April 13th @ 8:30am at Surrey Valley Church. There will also be morning Prayer Gatherings April 15-17 at 10:30am. The final evening will be a time to share communion and thank God for these days together. Everyone is welcome to attend. For more information, please phone 506-232-9286.